I've Seen Grand Theft Auto V. This One's Radically Different. The things that stick out to me about Grand Theft Auto V are not the major things I was supposed to focus on when I saw the game in action at Rockstar HQ this week. But I'll tell you those smaller things first, anyway. There's a nine-hole golf course in this game. You can play it. You can choose your clubs. There is also a yoga mini-game in this game. And ATM robberies you can interfere with. And cars you can customize. Sorry if I'm getting distracted from the main points of GTA V, but that's so very GTA, isn't it? The main mission path is well and good, but it's all the stuff that we can do on the side that draws us in. It's the swirl of activities—the casual corner-side chaos we can cause—that makes this series so captivating. GTA V is the first full-sized new Grand Theft Auto from Rockstar since 2008's Grand Theft Auto IV. It's been in development for several years and it's coming out in less than five months. But we know about as much about the game as we do of a book whose cover we haven't cracked. That's normal. Rockstar keeps most of the surprises and many of the features of their sprawling games secret until gamers can discover them with controller in hand. Until then, as is tradition, Rockstar reveals small portions of their games through trailers and through the occasional one or two-hour-long demo. They usually play the game in front of the press, as they did with me, proving that their game really runs though understandably not yet letting a nosy reporter just hop into the action and drive anywhere. Rockstar first told the world that Grand Theft Auto was coming back in late 2011. About a year later, they finally showed a little more in a second trailer and in a cover story for Game Informer magazine. In that time they shared two major details about the game: 1) that it's set in Rockstar's version of southern California, 2) that it stars not one playable protagonist, but three. When I asked them what merits this game getting a number at the end—we're not moving ahead a console generation was we were with GTA III and GTA IV—this three-character thing is what they point to. On the occasion of releasing a third trailer for the game (three-in-one, actually), Rockstar is showing the game again. This new showing gave me my first chance to see it with my own eyes. On a sunny day earlier this week, I took a short walk from Kotaku's New York City headquarters to Rockstar's in lower Manhattan. Visitor pass around my neck, I sat on a couch in Rockstar's demo room, fixed my eyes on a massive TV and watched some actual Grand Theft Auto V in action. I was flanked by reps from Rockstar, one who mostly chatted with me about the game, the other who played it. The one who played it used a PlayStation 3 controller, though the game's also coming to Xbox 360. There was no fakery. I got up and looked at the PS3 debug kit the game was running on. This was the real thing. Rockstar's main point, this time around, was to make clear how huge a change the three-character thing is to the series. When I asked them what merits this game getting a number at the end—we're not moving ahead a console generation was we were with GTA III and GTA IV—this three-character thing is what they point to. They say that it fundamentally changes the GTA structure we've known from all the recent games. Coupled with one other major change they told me about, that sounds about right. This isn't three GTA games mashed into one; it's something that is designed to flow like no GTA—frankly, no other game I've ever seen—before it. The other big change to the series that might merit the number at the end of the title? GTA V is a heist game. 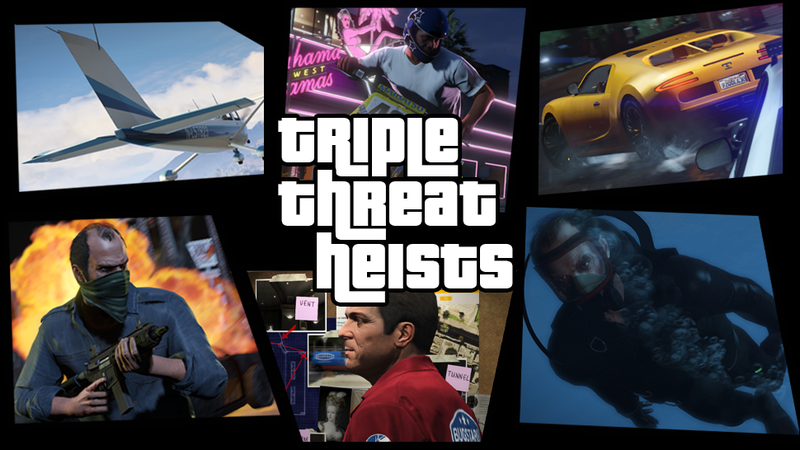 It's a three-criminal, third-person, open-world action-adventure that involves about five or six major heists—major acts of thievery that will involve lots of missions to set them up, choices by the player about how to commit the heists and, Rockstar claims, the kind of big moments that previously were saved for the ends of their games. There's a lot to get to. Let's break this down. The Rockstar people didn't show me any of the game's big heists, so I'll get back to that stuff lower in this preview. What they did show me was almost entirely focused on the game's unusual three-character system. They started showing me that by launching the game and loading a scene with Franklin standing in a helicopter. Franklin is the younger black guy seen hanging out in strip clubs in this week's trailer. He lives in Los Santos and is a repo man for an Armenian car dealer. He wants to move up in the criminal world. Franklin's helicopter was flying over the rural back-country of Blaine County, the so-called red state region to the blue state city Los Santos (read: GTA version of Los Angeles). It was day time. There's a weather system in the game and a 24-hour day/night cycle, but all I can report is clear blue skies. Good visibility! We were looking down at mountains with scrubs of pine trees on them. The city was on the hazy horizon, the ocean beyond. Then the guy controlling the game had Franklin jump out of the chopper. Good thing Franklin was wearing a rainbow parachute. I wish I had a stopwatch going so that I could tell you how long it took Franklin to drift to the ground. Thirty seconds, maybe? A minute? Parachuting is a thing in this game, the Rockstar reps told me. It hadn't been in GTA IV though was added in the episode/expansion The Ballad of Gay Tony. Franklin landed on the ground, walked past some people who were fishing by a stream. We spotted an RV and a dune buggy. I'd seen deer on the mountain as we drifted past. And a wildcat. The Rockstar guy who was playing the game hit a button (or pulled a trigger? I didn't ask) and up popped a circular menu with three headshots in it. One for Franklin, one for mid-life-crisis white guy/sorta-family-man Michael and one for crazy balding white guy lout Trevor. Those are the game's three announced protagonists. The Rockstar guy picked Trevor. Suddenly it was as if some deity overhead grabbed the game's camera, pulled it to the heavens, up, up, up and then shifted it to the other side of the map, and lowered it down. OK. It was just a glorified loading screen, but it was cool. Now, we were on a beach. Still day time. Trevor was in his socks and briefs, blood smeared on chest and back, the apparently dead bodies of west coast members of GTA IV motorcycle gang The Lost strewn everywhere. The Rockstar guys said Trevor is the series' most psychopathic character ever, but that he's charming, too. I'm sure the members of The Lost would agree. We'd left Franklin on the other side of the game's map. We were playing as Trevor now. This game's got boats. Trevor got in one and sped his way across some waves. Boats can contain scuba gear, one of the Rockstar guys said. Trevor put some on. We jumped out of a plane before, so why not a boat? The Rockstar rep on the controls made him dive. That's new: Grand Theft Underwater. (In case you didn't get the memo, 2013 is The Year of Going Underwater in Games, happening for the first time in series history in this year's new Animal Crossing, Assassin's Creed and GTA games (but probably not in any Forza that might come out this year—I'm guessing) Correction: I was too clever for my own good. A reader reminded me that CJ could dive in San Andreas. It was limited, but it counts! Sorry about that.). What I saw next was the coolest thing I saw during the demo. I'm not sure why it left such a strong impression on me. It wasn't the most action-packed thing they showed me or the most innovative. It just presented really well. They had Trevor scuba his way to a massive sunken cargo ship. I started thinking about all the stuff Rockstar could hide on the game's sea floor, all the hidden treasure and wrecks and whatnot. Some fish swam by. Then came the sharks. The sharks circled Trevor and even showed up as dots on the game's mini-map. Trevor didn't attack them; they didn't attack him. The Rockstar guys say sharks can attack. Beware. The Rockstar reps then did another character shift and jumped to Michael. He was not stripped to his underwear. He was wearing a suit. This guy lives in a mansion, so it, uh, suited him. For demo purposes the game switched to night time. Michael was on Vinewood Boulevard, the glitzy strip in the heart of GTA V's Los Santos. He walked past a ranting actress, past impersonators dressed in super-hero costumes, and past a tour bus that the Rockstar guys said would have taken Michael on a tour of the homes of the game's sleazy celebrities. They brought Michael to a small mission involving an actress being hounded by the paparazzi. She was in an alley or side street off the Boulevard ducking out of sight. This wasn't a main story mission but just a small happening. It was sort of like the pedestrian missions in GTA IV or the little interactive moments—the stick-ups and escaped prisoner chases—that would pop up while trotting through Red Dead. Michael had to get in a car and race the starlet away from the paparazzi, winding his way up to the fancy homes in the hills near the Vinewood (Hollywood) sign. He let the star out at her house. There could be more missions with her later, I was told. The Rockstar guys jumped into an actual storyline mission. The mission involved the player controlling all three characters. Think of it as an evolution of the one mission in Grand Theft Auto IV that featured not just Niko Bellic but the protagonists of the game's two episodic expansions. The difference was that this mission didn't just feature three characters who would be playable in their own versions of a GTA. This mission would require the player to hop from character to character, controlling each one for chunks of the mission. Don't get the wrong idea about this three-character stuff. Rockstar stresses that the game's campaign is single-player. There's an open-world multiplayer part of GTA V, but they won't discuss that now. They dismiss the theory that the game's three characters can be played co-op. One gamer will play as three characters, they told me. The main storyline game is not multiplayer. The player will simply switch from character to character at will while roaming the game's open world and, when undertaking missions that push the story forward, discover that, sometimes, a mission will involve two or three characters. And sometimes the missions will be solo, as they were in the GTAs before this one. The three-character mission I saw was something of a mini-heist. It has the traits of one of the game's big heists, I was told, but is also one-of-a-kind. They didn't confirm but it sounded to me like what we were looking at was essentially a test case to prove out the structure and systems of the big heists. This little heist involved knocking over an armored truck somewhere in Los Santos. Michael had cooked up a plan and briefed the other two characters about it. Trevor would take to the roofs and serve as a lookout. Michael would drive a dump truck and cut the armored truck off. Franklin would commandeer a tow truck and ram the car from the side (an earlier mission would involve getting them). They'd all wear jumpsuits (players would have grabbed them in an earlier mission, too). They'd each wear a different mask (players would somehow pick them). They'd escape in a getaway car (the player would have placed the getaway car in an earlier mission within a defined acceptable area). Note the distinction from older GTA games there? Players have some choice in how missions are set up and play out, a possible re-introduction of or variation on the emergent flexibility of how missions played out in GTA III. As the driving and the surveilling and the ramming were happening the game switched the player's control from one character to the next. Once Franklin rammed the armored truck and our characters approached the downed vehicle, the cops showed up. We were at a pretty high alert level: four stars out of five. The cops were bringing in choppers, and we were in for a shootout. I don't remember which character we first had control of, but from that point, the Rockstar rep who was playing the game was able to switch between the characters at will. Each character had a different weapon load-out and the switching was happening in real-time. The Rockstar guy had Trevor fire a rocket from his overhead perch. Fired it toward the ground toward cops who were approaching... Franklin I think it was. The Rockstar rep was controlling Franklin before the rocket even hit the ground in front of him. Unlike what I'd been shown before, all three characters were now in play at once. The two that weren't under player control were controlled by the computer. Rockstar says that you'll have to screw up badly to get your other characters killed. The computer will try to keep them alive and will also hold back and not let them get all the kills while you sit and watch. Our protagonists shot the cops. They raced to the getaway car which was where it would have been placed in an earlier mission. Rockstar pitches GTA V as a Rockstar North production. Rockstar North is the Edinburgh, Scotland-based studio that has long led development on Grand Theft Auto. Other Rockstar studios from around the world pitch in, too, but Rockstar says this is North's baby. They say North is trying to make the ultimate open-world game, one with the biggest world, most diverse, most responsive. You get the idea. When you see a GTA, though, you can't really see this. You can only, as we did virtually-literally this time, simply parachute in. You see a sliver. And you get told about the rest and do some combination of taking what they're promising and planning on faith and accounting for what they've delivered in the past. Typically Rockstar has delivered on scale and scope with their open-world games. GTA IV may have been the first game in the series to feel smaller than its predecessors, but it felt more dense than the sprawling Grand Theft Auto: San Andreas. I've sat at Rockstar HQ for demos for GTA: San Andreas, IV, Chinatown Wars, Red Dead Redemption and L.A. Noire. What they promise, they're usually good for. I can't remember anything they ever told me about that didn't turn out to be in the game. And when they're excited about a specific aspect of the game—the horse in Red Dead Redemption, the smoothness of moving while shooting in Max Payne 3, the mini-games in Chinatown Wars—I find that they deliver. Still, most of it is simply discussed, not shown. So you gotta believe, as it were. In recent years, they've improved a number of aspects to their open-world games. They've tinkered and gradually improved their driving and shooting controls. They have smartly added gameplay shortcuts to cut down on tedium and make the games fun. They've repeatedly tried and generally succeeded in making memorable lead and supporting characters. They have done well adding some modicum of narrative decision-making (in IV) though reduced how much leeway players have had to execute the game's missions. Red Dead Redemption, which was developed mostly by Rockstar San Diego but with other studios, including North, involved, also stepped the GTA series forward. That game improved on the visuals of GTA IV, populated its world with more randomly-appearing mini-missions and gave players a more satisfying, consistently-interesting interactive journey for their lead character. With V Rockstar promises improvements on all of those fronts. Driving will feel tighter and more aligned with what you'd expect from a racing game, they say. Combat? It'll pull in lessons from Red Dead and Max Payne 3, they say. A combat-ready jog will let you run with a lowered weapon at the ready; you'll see an X appear in your targeting reticule when you kill an enemy (apparently players in IV would think they'd kill a downed enemy, move on and then get shot by that recovering foe); a wider field of view will make shootouts more comprehensible, a combat roll and the addition of many more cover points will give players more ways to play through a firefight. This is what they tell me. I saw some of it but didn't control any of it. It's early going. The game's not out until September. They tend to not allow hands-on this early. They also told me that—finally—you won't lose the gun your character is wielding just because you ran out of bullets. That's worth the V all by itself. The Rockstar guys also told me how huge the game is and all that's in it. Well, some of what's in it: military bases, beaches, mountains, rivers, meth dealers, biker gangs.... the whole map is open from the start. Biggest weapons list ever. Biggest vehicle list, many of them customizable for looks and performance. Cars. Trucks. Motorcycles. Bicycles. Jet fighters. I saw a jumbo jet in the sky. Can we fly that? Not sure, probably not. These games have limits. The metaphor Rockstar likes for this game is long-form narrative TV with an ensemble cast. Cut from one character to the next. Skip the parts where characters are doing boring stuff and go right from interesting scene to interesting scene. That doesn't mean the game is all missions and no wandering. Rockstar gives every sign that there will be a ton of wandering permitted. They also give the impression, though, that the character switches will let them keep players surprised and entertained. Take that transition they showed me from Franklin walking off his parachute drop to a bloody Trevor chilling on the beach in his underwear. The metaphor Rockstar likes for this game is long-form narrative TV with an ensemble cast. Cut from one character to the next. Skip the parts where characters are doing boring stuff. Rockstar wants us to feel like GTA V's three characters live their own lives when you're not controlling them. When you're one guy, the other two are doing their thing, and when you switch to one of them, Rockstar intends to often surprise you. That's a neat trick, but I was skeptical how often they'd pull off an on-the-beach-in-his-underwear type of surprise. You guys might just have three of those, I suggested. No way, the Rockstar rep told me. We'll be doing a lot with that. The three characters are supposed to provide players three different experiences in the game's massive world and they're designed to make my playthrough feel a little different than yours. We can customize our characters (tattoos, clothes, haircut, stats—things like strength, shooting, driving and flying acumen that can all get better with more use), but we also can meet different characters as different characters. Rockstar expects us to be comparing notes. Oh, you met him while playing as him? I did that differently. You robbed that place how? That's not how I did it. That sort of thing. Each of the three characters even has his own bank account, allowing you to manage each one's purchases differently. These guys can buy property. The example I was given was a taxi company. It will generate regular income. They can buy houses, too. Rockstar seems more big on choice with this game than they were with GTA IV. Sure, that game let you make decisions at key junctures about who would live or die. This game's decisions seem like they'll be both, bigger and smaller. The characters already differ from each other. They're all unrepentant criminals, but they also all start with different stats. How we improve their skills and how we deck them out will make them feel more distinct. How they execute a heist may change things up as well. For the big heists, Rockstar told me, players will be choosing a lot of the variables: how your guys approach a place you want to rob, who does what, whether to go in guns blazing or with stealth, which other characters go on the mission. See, you'll be able to hire support characters and, if they survive, they'll be able to help you in subsequent heists. The more money you have, the better support characters you can get. Heists will end with an after-action report and the money from the haul divided among the crew. Rockstar says that each character will be able to have different experiences in the game world. Some events that pop up in the game world will only pop up for one of them. Plus, each has a special ability. That might seem a little weird, but get this: ex-bank-robber Michael's good with guns, so, when you're controlling him, you can slow down time as you shoot; repo man Franklin can do the same while driving; Trevor can go into a melee rage of sorts and deal more damage. This stuff is triggered after a meter fills. It might ring a Red Dead bell. Or even a Max Payne one. I remember the good stuff from GTA IV but also the disappointing things. Niko's story dragged by the time he got to the New Jersey-like Alderney. Don't worry, they say. The three characters will keep you interested. Niko's friends could be annoying. They were always calling, trying to bug me, essentially, to play mini-games. Understood, Rockstar's reps say. Don't worry about being badgered, they're handling it differently, and the mini-games will be fewer but deeper. You can use the in-game phone to take screenshots, by the way, and share them on Rockstar's Social Club website. What about all that dating stuff? Relationships aren't a mini-game in GTA V, I'm told. They make the police encounters sound better, too. In this new game, we can still try to escape the circular zone that flashes on the mini-map when cops come after our malcontent protagonist(s). But, this time, we'll be able to try to hide inside that alarm radius, if we'd like. The cops will use a line-of-sight system, so they won't just magically know where you are. If they have a helicopter in the sky, they'll be able to see plenty. And you'll see them use hand signals to communicate what they're doing. Rockstar also wants us to know that we'll feel like we've got money in this game. We'll be using these characters to buy or otherwise obtain some fine gear. Franklin, repo man that he is, will be able to access some good cars early on. They were talking to me about being able to buy your own helicopter and needing to buy a helipad in order to keep it. The heists, they say, will generate millions. As for tone, that was a thing with GTA IV. Some gamers complained that it was too serious, that it wasn't as over-the-top and occasionally cartoonish as GTA III, Vice City and San Andreas. It was satirical, sure, but Niko Bellic was a serious man in a serious city. The new game isn't a return to the tone of San Andreas, Rockstar told me, but it's also not a repeat of IV. The weirdness of real L.A. affords Rockstar more leeway to have some fun with how things go down in this new game. Plus, the three characters might enable a variety of storytelling tones. None of what they're promising sounds impossible. All of it sounds quite good. A GTA with more choice, more variety, and less tedium? Yes, please. Do that. The GTA V I saw this week is not exactly the GTA V of its trailers nor the GTA IV I played in 2008. I'm optimistic about it, but I must stress that what I see in advance never can sufficiently compare with what we all can eventually play. It's weird to see such a small piece of it, though it's exciting to see something as different as the three-character structure. That could be a huge game-changer. I enjoy the way Rockstar tells stories in its games and I look forward to seeing how they tell three interwoven ones at once. What they showed me, though, was all action and running through a city. What you see in trailers is all character stuff. Michael's not just a crook but a beleaguered dad with a wife and two teenage kids he probably doesn't relate to. Franklin's an ambitious lower-level crook looking for a bigger score. Trevor is a nut who lives on the outskirts. That's all story material and, combined with the action I saw, that's a GTA. Separated, they're pieces of the elephant. It's hard to marry the story and the action in one demo and it's nearly impossible to convey the best elements of playing a GTA—the serendipity of, say, the right music coming on the in-game radio station while you bump a cop car and suddenly are caught up in a three-county chase from the law that coincides with a beautiful sunset, some fool pedestrian yells at you as you nearly run them over and... there we go, let's jump that ramp off the highway and dunk the car into the river... get out of the sinking car, swim to safety, get away from the barks of the cops so we can't hear them anymore and then just bob there in the water, in the darkness. Exhale. Enjoy. That's not in the demos. It can't be. That's not even a story or a mission they can script. It just happens. It's always the best thing GTA offers. Nothing I saw this week leads me to think that that won't happen in the new game. It appears Rockstar's enabling plenty of that for the new game in its new setting. It's exciting to see something as different as the three-character structure. That could be a huge game-changer. As for looks, I'm honestly not sure what to make of the V's graphics. I never played a Grand Theft Auto for graphics, but I appreciated how good GTA IV looked in its day. I popped that game into my Xbox 360 again on Wednesday morning. It doesn't look as good as I remembered it. The GTA V I saw running on PS3 hardware at Rockstar looked better. That GTA V, though, didn't look as good to me as the one we see in the trailers. I suggested to the Rockstar reps I was talking to that their trailers are captured off of a PC, off of something that's pumping out better graphics. The version I was watching them play might be an older build, they said, but, no, the trailers are captured from PS3/360-standard machinery. I asked them this again, hours later, to be sure. Yes, they said. The trailers are, as always, running in the game's graphics engine, mixing gameplay and cutscenes, and—their phrase, not mine—it's current-gen footage. Maybe what they capture for trailers is just staged well. I don't know. Or maybe the graphics will look better and better as the game gets closer to release. GTA V is by no means ugly. It looks quite nice. But what I saw in trailers never looked current-gen to me. What I saw played in front of me did. I wish Rockstar would say they're making a next-gen version or a PC version, but the company line is that they have no plans to do so. Take that for what you will. I'd still like a GTA V that looks as sharp as the game does in its trailers. Graphics are as important as you want them to be. GTA: San Andreas most definitely looked like a game made on aging PS2 hardware. It's still my favorite in the series. I'm more of a gameplay guy, an open-world explorer and someone with an unhealthy appetite for good sidequests. I'm very interested in seeing how much of this three-character structure's potential Rockstar can realize, and I'm glad they're doing something so different and so outside of their standard formula. Rockstar has about four months to go to polish this game and deliver something special. Several years ago, I saw Red Dead Redemption at just about the same level of completion. It was about where GTA V appears to be now, so I'm hopeful about how this game will come together. At worst, this could be an interesting stumble of unrealized potential, taking the biggest risks I've seen in a GTA since GTA III.